Does anyone know of an event where people of our different cultural groups can discuss mental health issues together? Like how to help “loners”? I’ve seen this problem in many cultures. It’s not just ours. Maybe we can work together towards a solution. Please let me know. In the meantime, here is a wide variety of very affordable events in our city where you can meet your neighbours and make new friends: May is Asian Heritage Month with lots of happenings organized by our Public Library. It’s also the month of free photographic exhibitions all around the city. And it’s Dutch Heritage Month too. May also has Mothers Day. While these celebrations might not be cheap, I feel mothers should be pampered with lunches or dinners, flowers or chocolates. They are worth breakfast in bed or at least a visit or a telephone call. Aside from Mothers Day, most of the following are free or almost free. Armenia. Sacred Concert. May 4. 8-10pm. Free. 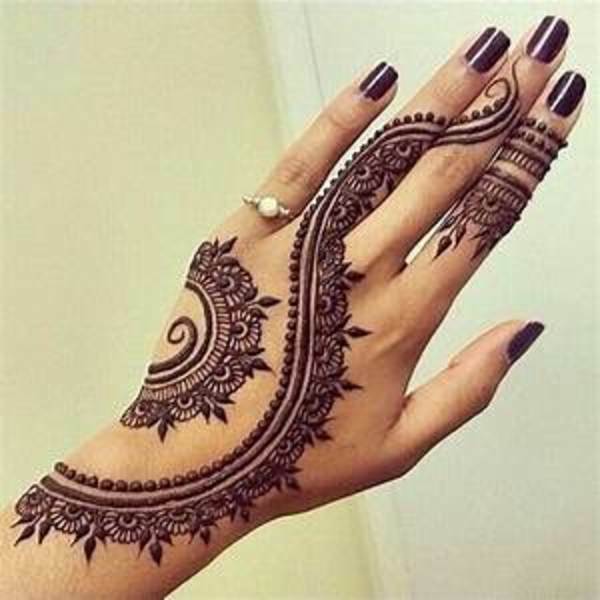 Traditional. 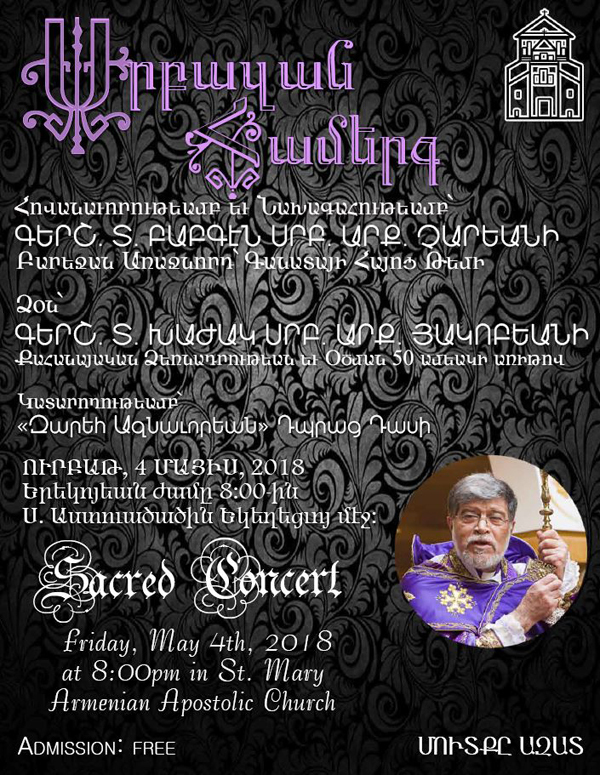 St. Mary Armenian Apostalic Church, 45 Hallcrown Place, North York: http://www.acctoronto.ca/event/sacred-concert/. Asia. Asian Heritage Month. Toronto Public Library. For a list of 110 interesting events for adults and/or children: https://www.torontopubliclibrary.ca/search.jsp?Ntt=asian+heritage+month. Among the films is a very sad one about Korean, Chinese and Filipina “comfort” women, prisoners of Japan when it was fascist. There’s also A Tale of Samurai Cooking (2009). Please note that members can borrow some of the films from the Library for your use at home for free. China-Canada. Britain. Sri Lanka. Malaysia. Book Launch: Warlight by Michael Ondaatje. Monday, May 7. Doors open at 6:30pm. Event begins at 7:30pm. $10 (or $34 book/ticket combo). Rush tickets available at the door. Reading by Michael Ondaatje, conversation with Madeleine Thien, and book signing. Trinity St. Paul’s United Church & Centre for Faith, Social Justice and the Arts, 427 Bloor Street West. Michael Ondaatje is the author also of In the Skin of the Lion, and The English Patient. Madeleine Thien is the author of Do Not Say We Have Nothing (2016) which won the 2016 Governor General’s Award and the Scotiabank Giller Prize. 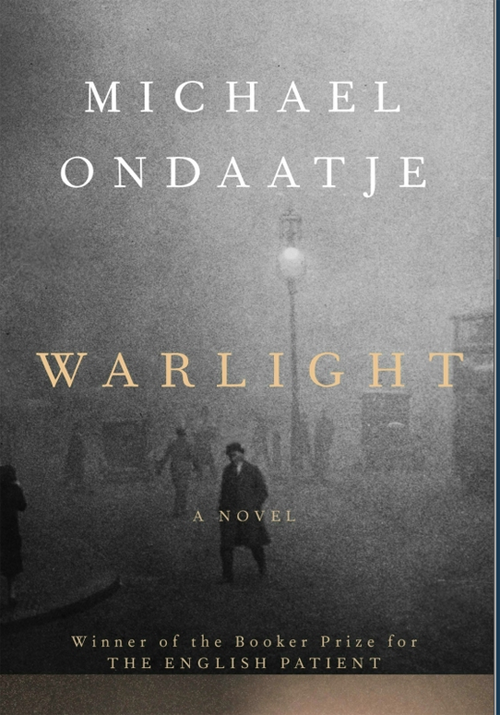 https://www.eventbrite.ca/e/michael-ondaatje-warlight-book-launch-tickets-42398235263. Israel. Spotlight on Israeli Culture. This festival has been going on since March 8 and continues until June 1 with films, visual arts, music and theatre. Having fallen in love with Israeli food during a recent trip, I wanted to go to its session on cuisine on May 9. Alas, it was sold out in April– Ruth. Book now for its May film schedule if you are interested. 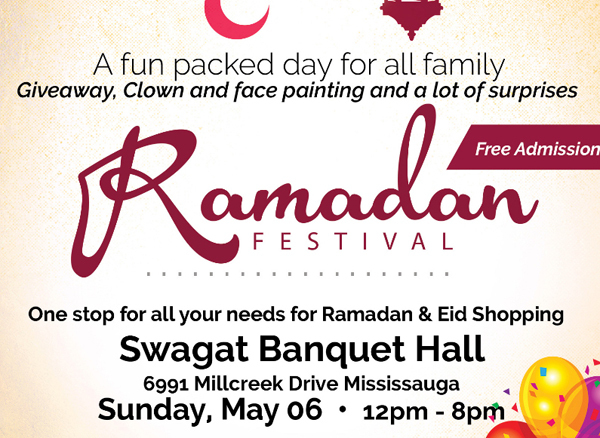 It’s on: http://www.spotlightonisraeliculture.ca/daily-schedule-may2018/. Trailers are on TJFF.COM. Image of Aviva Chernick and Itamar Borochov from the Spotlight on Israel website. Japan. High Park Cherry Blossoms. Free. Current prediction. May 5-12. But check the City of Toronto’s website for dates as it depends on the weather. They only last a week. http://www.sakurainhighpark.com/predicting-blooms/. If you visit the trees on a weekend, heed all warnings about stagnant traffic and big, big fines for illegal parking. Best take the TTC to High Park and walk south, or go on a weekday. Most of these stunning flowering trees are to the west of the main road near the restaurant. 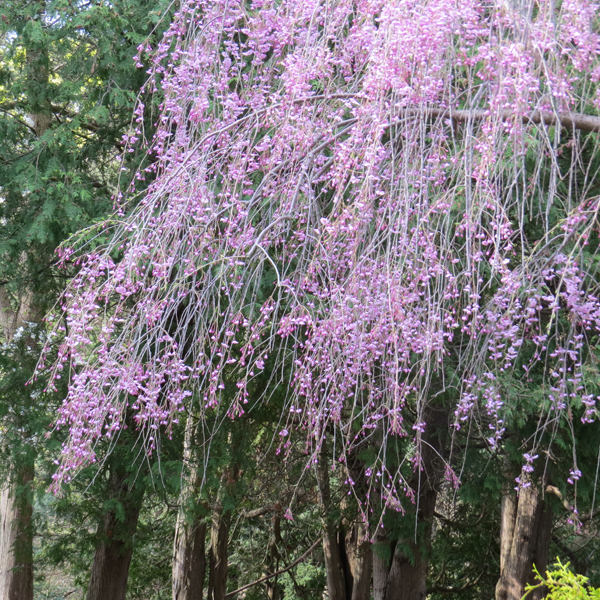 The first Japanese Somei-Yoshino cherry tree was planted here in 1959 and was a present from the citizens of Tokyo. There are also cherry trees on Centre Island near the south side of the bridge, near the fountain. And don’t forget the lovely weeping cherries in the Kariya Park, the Japanese garden just south of Celebration Square in Mississauga. Latvia. 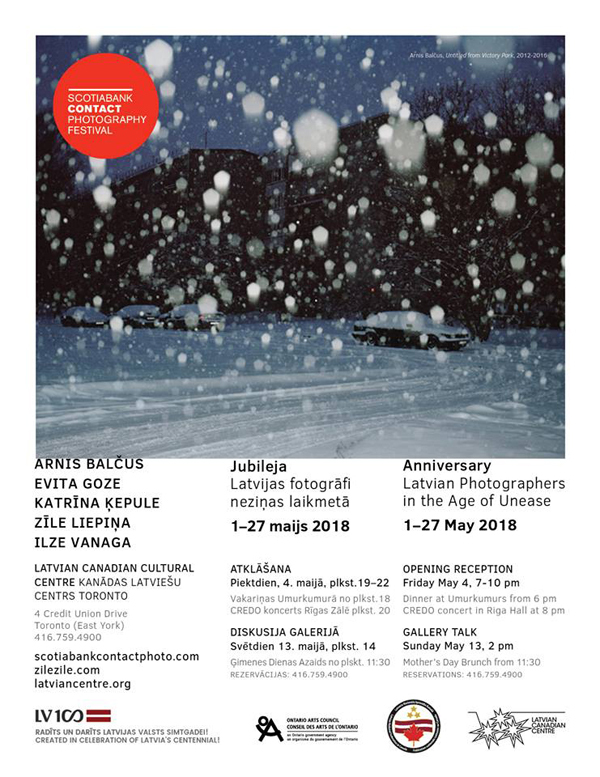 Anniversary: Latvian Photographers in the Age of Unease. Arnis Balcus | Evita Goze | Katrina Kepule | Zile Liepins | Ilze Vanaga. May 1-27. Opening Reception: Friday May 4. 7-10pm. Check prices as the reception includes a dinner and concert. Canadian Latvian Cultural Centre, 4 Credit Union Drive, Toronto. 416-759-4900. “The year 2018 marks 100 years since the proclamation of the Republic of Latvia. This centennial serves as a point of departure for the examination of the history that shapes Latvian identity, and the current political climate which threatens the region’s security.” www.zilezile.com. Multicultural. Scotiabank CONTACT Photography Festival. 200 exhibitions and happenings. Free. For a map of venues, see: https://scotiabankcontactphoto.com/map . For all exhibitions see: https://scotiabankcontactphoto.com/exhibitions. The Calatrava-designed atrium at Brookfield Place is one of the most stunning settings and this year, Marleen Sleeuwits’s “Not The Actual Site” takes over the area with her depictions of “non spaces” such as vacant zones in airports, unoccupied corridors of hotels and empty rooms in office buildings. Chinese photographer, Wang Yishu, captures the familiar yet absurd within ordinary scenes. See four of his works in the Osgoode subway station. Emeka Ogboh’s billboard on The Power Plant’s south façade, WER HAT ANGST VOR SCHWARZ, is one of a series inspired by the food tastes and experiences of Africans living in Europe, especially Germany and is presented in conjunction with his solo exhibition inside the gallery, on view until May 13, 2018. A Forest of Canoes is a site-specific installation at The Bentway in which Vancouver-based artist Dana Claxton (Lakota Sioux) considers the iconic role and symbolism of the canoe in Canadian, Metis and Indigenous histories with images depicting a range of canoe types. 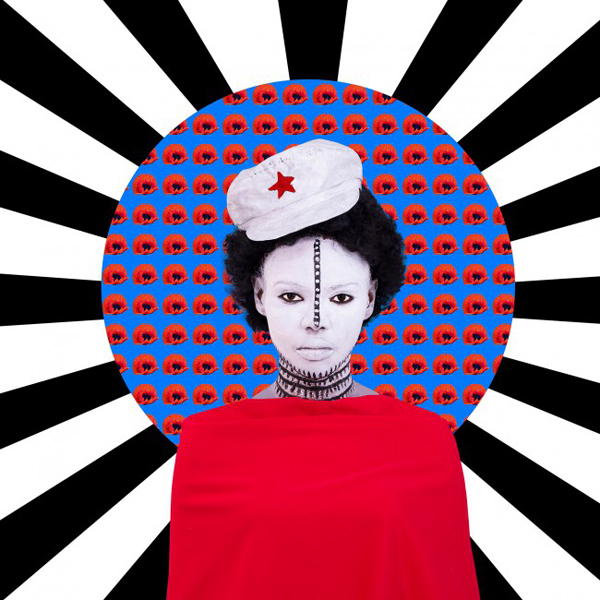 Image of: Reflections of Hope by Aida Muluneh. from CONTACT website. Multicultural. Muslim. Lecture on Informal Justice in Community Settings – Fears, Stereotypes, Opportunities, and Challengers by Dr. Mohamed Keshavjee. Tuesday May 8. 7-9 pm. $5. Lower Social Room, Noor Cultural Centre, 123 Wynford Drive. 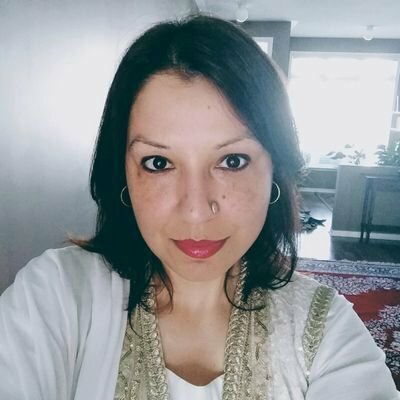 Dr. Mohamed Keshavjee is a British- and Canadian-trained lawyer, a global specialist on mediation, and a former Member of the Steering Committee of the World Mediation Forum. He is the author of ‘Islam, Sharia and Alternative Dispute Resolution: Mechanisms for Legal Redress in the Muslim Community‘. Image from Noor Community Centre website. Multicultural. Mothers’ Day. May 12 or May 13. This day honors mothers and motherhood in Toronto. 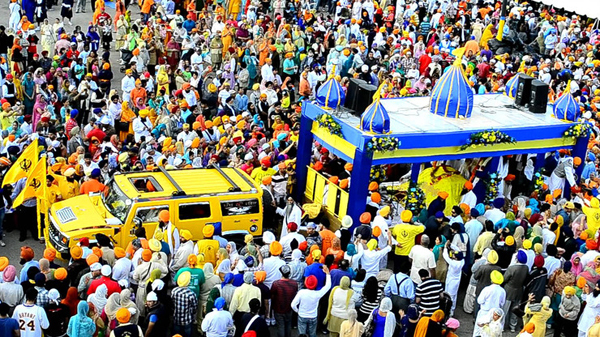 Here’s an opportunity to find out how other cultures celebrate this special day. Ask your neighbours what they do for their mothers today. With many restaurants already booked up weeks in advance, we suggest you try to book a table as soon as possible. Prices for meals and high tea are above our usual limit for inclusion in this blog but mothers are worth the expense. You could take your mother to an ethnic restaurant she’s been curious to try. If she wants, you could join a Jamaican, Nigerian or Indian dinner group. She might like British high tea. The Jamaicans $50 Mother’s Day dinner special is at: https://www.eventbrite.ca/e/mothers-day-brunch-gala-tickets-42320790624?aff=es2. Accompanied mothers get a free Indian lunch or dinner at Khazana in Milton: https://www.eventbrite.ca/e/mothers-day-at-milton-khazana-tickets-45525358573?aff=es2. Brunch is $50-$55 at Bombay Street Food (https://www.eventbrite.com/e/mothers-day-brunch-at-bombay-street-food-tickets-45357016056?aff=es2). 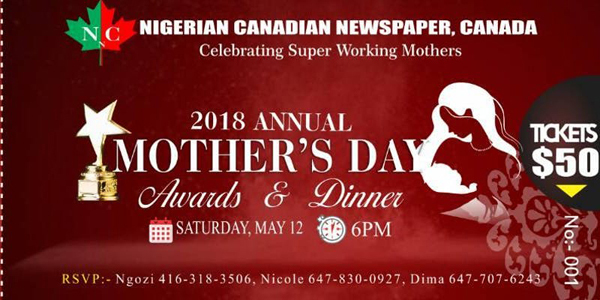 The Nigerian Canadian Newspaper is advertising its annual Mothers Day Awards and Dinner for working mums. (https://www.eventbrite.ca/e/nigerian-canadian-newspapers-annual-mothers-day-ascend-with-no-limits-tickets-44706450196?aff=es2). It looks interesting for $50 in Etobicoke. Muslim. Panel Discussion On Being a Canadian Muslim. May 2. 6:30-8:30pm. $5. Friends House, 60 Lowther Avenue (near Varsity Arena). Moderator: Naheed Mustafa, Writer and Broadcaster. 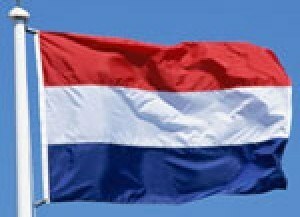 Netherlands: Dutch Heritage Month. Flag Raising. May 1. Noon. Free. Queen’s Park. For other Dutch events, see: http://www.dutchtreat.ca/ and www.facebook.com/groups/DutchTreatCanada. Russia. 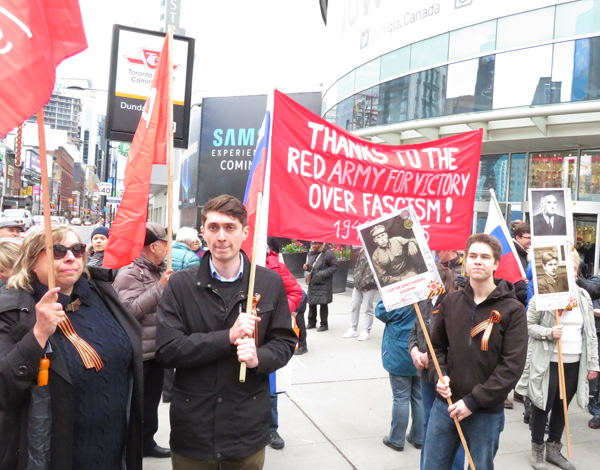 Immortal Regiment in Toronto Center. May 6. 1pm. Free. Parade starts at Yonge and Dundas, goes to Queens Park and then to Old City Hall. This parade honours the memory of the military that “defeated fascism in World War II”. Family members carry portraits of their loved ones. This is an event that many of us can also celebrate. Victory in Europe Day (V.E. Day) was May 8, 1945.